Simon Thornton dedicated his maiden European Tour win to his late father. Picture ©Getty ImagesAn emotional Simon Thornton dedicated his maiden European Tour victory to his late father after the Irishman showed nerves of steel to beat Tjaart Van der Walt of South Africa in a play-off and claim the Najeti Hotels et Golfs Open presented by Neuflize OBC title on Father’s Day, writes the European Tour. The Irishman holed several tricky putts on the back nine in an enthralling battle of wits with his South African playing partner in the final group at Aa Saint Omer Golf Club. The most important putt of all, however, came at the 18th during regular play when, after Van der Walt sealed a par, Thornton was left with a ten-foot putt to take it to extra holes. Under the most intense of pressure, the 36 year old rolled it into the cup and clenched his fist in celebration as he signed for a one under par 70 to finish alongside Van der Walt on four under. He kept his cool once again in the play-off, finding the fringe of the green while Van der Walt’s approach landed in a greenside bunker and after the South African’s sand shot fell 12 feet short, Thornton rolled a perfectly-weighted putt from 30 feet which slid just left of the hole but ensured a par. When Van der Walt’s par putt came up short, Thornton tapped in to the rapturous applause of the watching crowds, before dedicating the victory to his father, who passed away three years ago. “It’s so big for me,” said a tearful Thornton. “On father’s day too, he passed away three years ago and it still hurts, but they are happy tears today. This is dedicated to him. “I didn’t play particularly well today in perfect conditions but I got up and down when I had to and holed good putts. Thornton’s rise is an incredible story of progression to the top of European golf against all odds, as he was a seven handicap golfer just over a decade ago. 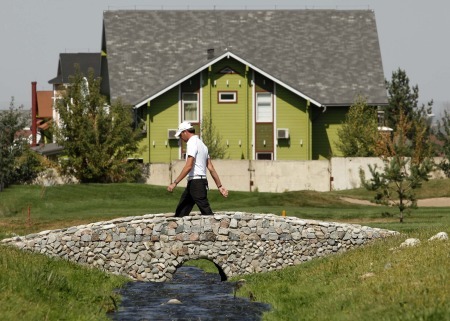 Born in Bradford, England, he moved to Ireland to become an Assistant Professional at Royal County Down Golf Club before rising from the Irish professional ranks to the Challenge Tour and then to The European Tour. “Hopefully this is a stepping stone for me,” said Thornton, who carded the first hole in one of his professional career on the third day in France. “I’ll go home this week now and celebrate, take a week off, and then play in the Irish Open. For Van der Walt, who also carded a one under par final round 70, it was a second runner-up finish on The European Tour after finishing second in the Africa Open last year. Englishman Seve Benson sealed the highest finish of his European Tour career as a one under par 70 left him in outright third place, two shots ahead of his compatriot Robert Dinwiddie whose final round of 70 earned him a fourth-placed finish. Lurgan's Gareth Shaw and Royal County Down's Simon Thornton kept their victory hopes alive in the Challenge of Ireland at Glasson Golf Hotel near Athlone. 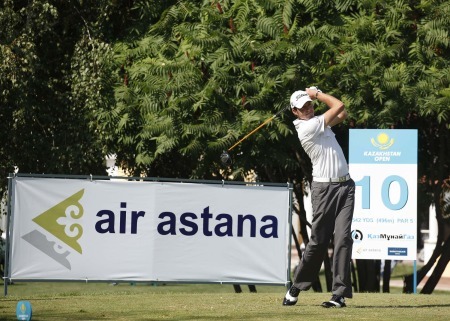 Simon Thornton shot a 66 to move two strokes clear of the field in the Kazakhstan Open. Picture by Phil Inglis.Simon Thornton built on a hot start to fire a superb 66 and open up a two-shot lead in €400,000 Kazakhstan Open on the European Challenge Tour. Simon Thornton is looking to get back to the European Tour with victory in Kazakhstan. Picture by Phil Inglis.Simon Thornton believes it’s time to break his duck and win on tour after falling two strokes behind English starlet Tommy Fleetwood entering the final round of the Kazakhstan Open. 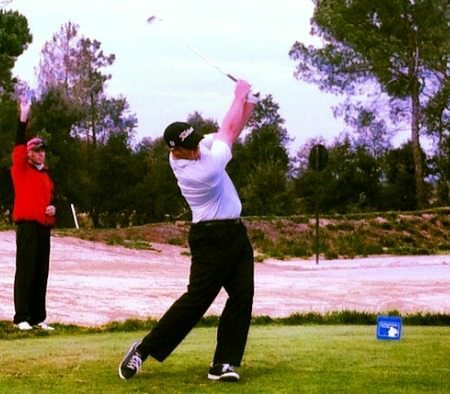 Peter O’Keeffe rips a long iron down the ninth on the Tour Course at PGA Catalunya Resort. David Higgins found his putting touch to fire a sensational six under 64 on the Tour Course and get within two shots of the lead after the second round of the marathon European Tour Qualifying School final stage at the PGA Catalunya Resort. As Douglas’ Peter O’Keeffe came back from the dead by following his opening, wind-blown 81 with a five under 65 to keep alive his hopes of making the cut on Tuesday, 39-year old Higgins made six birdies in an immaculate round to share seventh place on five under par. Simon Thornton has a share of the lead through three rounds in St Omer ©Getty ImagesSimon Thornton carded the first hole in one of his professional career on the way to a stunning six under par 65 as the Irishman moved into a three-way tie for the lead going into the final day of the Najeti Hotels et Golfs Open presented by Neuflize OBC, writes the European Tour.